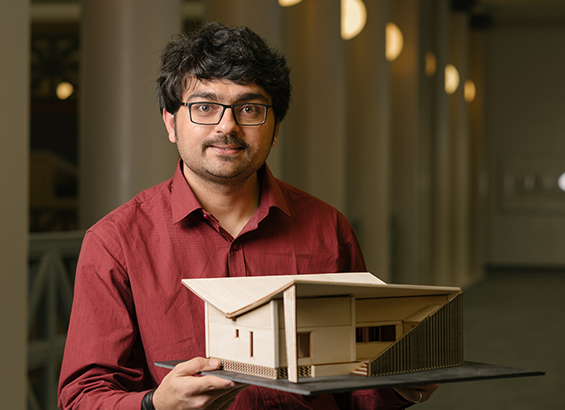 UH Architecture graduate student Tanmay Thakker with his model home "Screen House"
Construction on "Screen House" will begin in the spring. As a child growing up in India, Tanmay Thakker had a fascination for buildings - the look, the feel and the materials. That passion pushed him to an architecture career and the chance to realize his dream of designing and building homes. 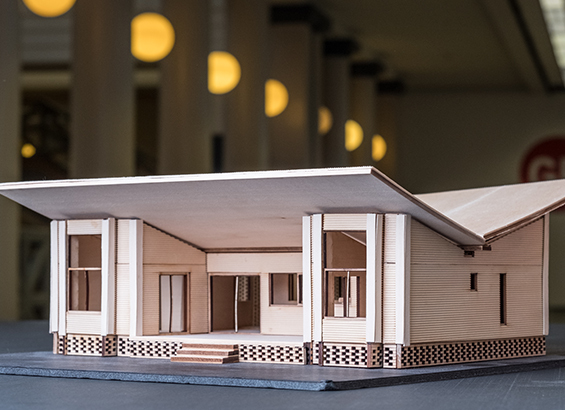 The University of Houston Gerald D. Hines College of Architecture & Design graduate student recently won The Sharpstown Prize for Architecture for designing a single-family home that will be built on a vacant lot in the Sharpstown Community of Southwest Houston. Thakker’s design, “Screen House,” is inspired by his view of today’s high-tech world. The competition was sponsored by Seeds of Sharpstown, an organization investing in “the renaissance of Sharpstown.” Professor Rafael Longoria incorporated the competition, with guidelines provided by Seeds of Sharpstown, into the curriculum of his graduate level studio class of ten students. “This sophisticated integration of real-world projects into the curriculum provides students an opportunity to not just test their ideas but to also challenge the status quo of the marketplace and the housing industry in both what and how they consider single family design,” said Gail Peter Borden, FAIA professor and director Graduate Programs. Working with a $140,000 budget for the total cost of construction, students had to design a home between 1,000 and 1,200 square feet, with three bedrooms, two bathrooms and no taller than two stories. The students spent time in Sharpstown learning about its history and changes residents want to see in the future. Thakker’s analysis revealed the context consisted primarily of homes made out of indigenous brick, so his project adopted a combination of brick and metal for his scheme to integrate. Construction on the home will begin in the spring. Other finalists include: Jennifer Carpenter Minor with “Sustainability/Modern Comfort”; and Brooks Caton, “Redefining the Hearth”.